Present in 8 California counties, as well as 10 other US states and four Canadian provinces. No information on the USDA GRIN website. GBIF also shows a couple points in Japan and northern Europe outside its native range. Present in 8 California counties, as well as several other US states that are similar to California. Not on any US noxious weed list. However, Ventenata is beginning to replace perennial grasses and forbs along roadsides and in hay, pasture, range and CRP fields in the western U.S. In addition to having minimal forage value for livestock or wildlife, ventenata is also undesirable because its shallow root system may cause the soil to be more prone to erosion. Over time, decline of productivity and land value occurs. In the western U.S., ventenata is beginning to receive a great deal of attention due to its rate of spread and difficulty in control. Not on any US noxious weed list. However, Ventenata is beginning to replace perennial grasses and forbs along roadsides and in hay, pasture, range and CRP fields in the western U.S (including areas that are similar to California). In addition to having minimal forage value for livestock or wildlife, ventenata is also undesirable because its shallow root system may cause the soil to be more prone to erosion. Over time, decline of productivity and land value occurs. In the western U.S., ventenata is beginning to receive a great deal of attention due to its rate of spread and difficulty in control. The Global Compendium of Weeds has only one entry for one other species of Ventenata. 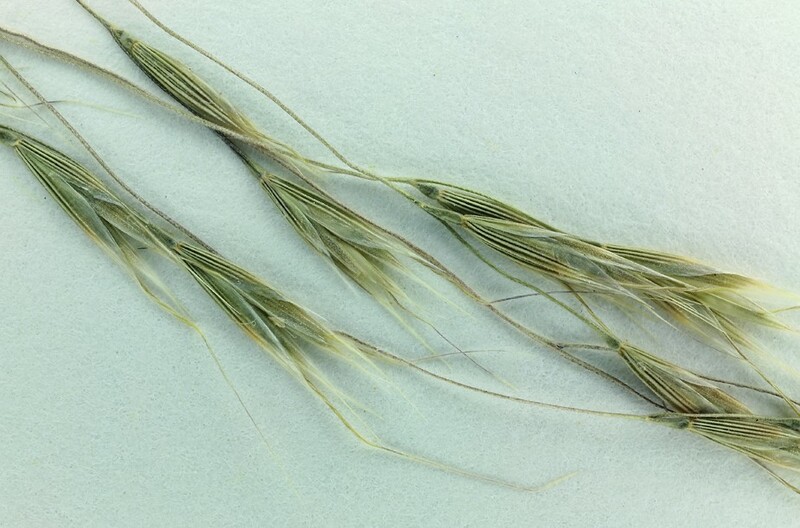 However, its synonym genus is Avena and Avena barbata and Avena fatua are both invasive in California. Ventenata is beginning to replace perennial grasses and forbs along roadsides and in hay, pasture, range and CRP fields in the western U.S. Yes for displacing the plant community but the description does not say that it overtops or smothers them. No mention of this as one of its impacts. Not listed in the USDA Fire Effects Information System database. Defaulting to no due to lack of information. Can be grazed but has minimal forage value and later in the season the stems harden and become unpalatable. Ventenata is beginning to replace perennial grasses and forbs along roadsides and in hay, pasture, range and CRP fields in the western U.S. In addition to having minimal forage value for livestock or wildlife, ventenata is also undesirable because its shallow root system may cause the soil to be more prone to erosion. Over time, decline of productivity and land value occurs. Grows only 10-46cm high, so no. Reproduces by seed. No indication of vegetative reproduction. No indication of this in the NRCS factsheet and it seems unlikely for an annual grass such as this. About 15 – 35 seeds are produced per plant. Ventenata is a winter annual that germinates in the fall when temperatures are moderate to high. No indication of dormancy requirements. An annual grass, so must produce in its first (only) year. Seed heads are produced May and June, according to USDA. Flowering time in California is June-September, according to Jepson. Using the California months, I am extrapolating to more than three months seed production. It can be spread by humans and animals due to having long awns. There is no mention of this in the NRCS factsheet. Uncertain but scored as No by default. Ventenata is spread primarily as a contaminant of Kentucky bluegrass, hay and annual crops. In addition, ventenata is found along roadsides and likely is moved along the transportation corridors where it has opportunities to move into surrounding areas. It can also be spread by humans and animals due to having long awns. Much of this evaluation comes from a factsheet on the USDA PLANTS website written by staff from the USDA Pullman Plant Materials Center.